This long but narrow hall built in 1884 was for many years Seaforth's only social centre. In June 1912 it was announced that in order to screen motion pictures the hall had been converted to the "most elaborate picture palace in the district, with electric lighting" (In fact until the following year it was the only picture palace in Seaforth). Seating over 200 the Lathom Hall Picture Palace opened on Saturday 8 June 1912 showing "A Red Cross Martyr", "Burglar Proof Villa" and "Her Saints Day". The Motto of the management was "Come Once and You're A Regular Patron" which the management of the Lathom still adhere to today. Despite the hall drawing great attendances for the twice weekly change of films it had a short lifespan as a picture house and closed in 1916. During the Second World War it was used as a NAAFI (Navy, Army and Air Force Institute) storeroom and later as a school kitchen. It was converted into a dance hall in the 1950s, closing for a period following disorder in February 1958. 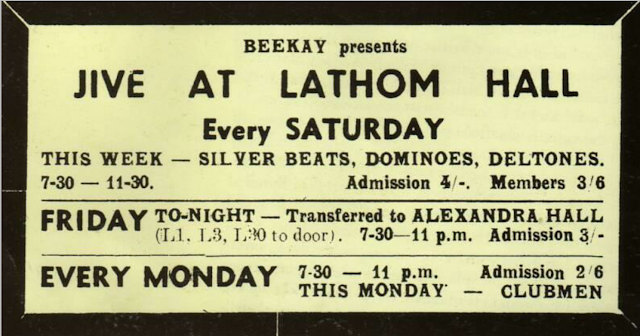 Two years later, in May 1960, the Silver Beetles (or the Silver Beats as they called themselves on this one occasion) played Lathom Hall for the first time. 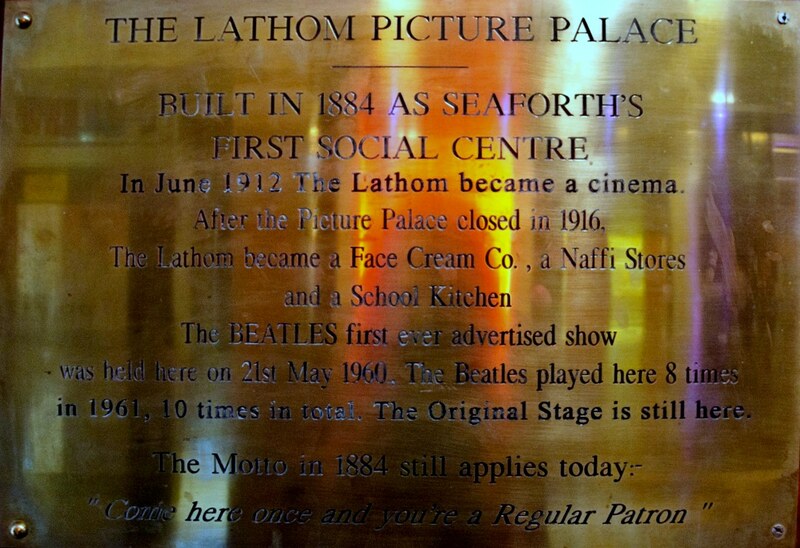 This was to be the venue for the Beatles' first ever properly advertised engagement, a booking by the Crosby based promoter Brian Kelly who ran his Beekay* dances at Lathom and similarly tough venues in north Liverpool such as Aintree Institute, Litherland Town Hall and Alexandra Hall in Crosby**. Coming from south Liverpool these areas of the city, all north of the Pier Head, and heavily populated by the descendants of the Irish Catholics who had fled the Great Famine, were completely unfamiliar territory to the group in 1960 and probably required several changes of bus to get there. The Silver Beetles (Silver Beats) in May 1960: L-R: Stuart Sutcliffe, John Lennon, Tommy Moore, Paul McCartney and George Harrison (photo: Cheniston Roland). 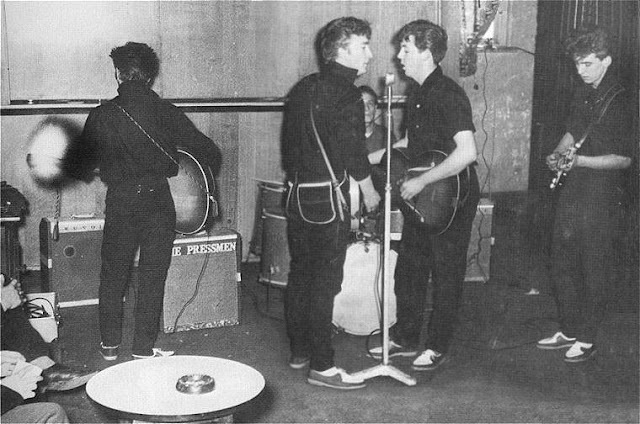 But first they had to audition for Kelly and did so on the evening of 14 May 1960, playing a few songs during the interval. Kelly must have been impressed as he booked them to appear at the following Saturday's dance, actually headlining over King Size Taylor. 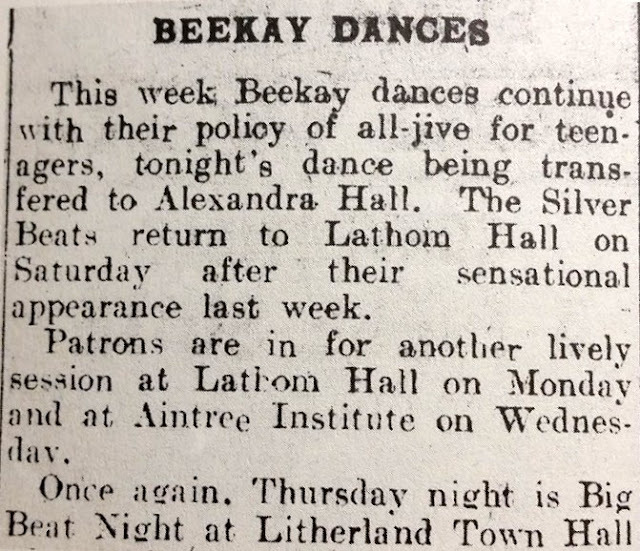 On 20 May a local paper, the Bootle Times went so far as to report the Silver Beats appearance as "sensational" and no doubt helped to build up excitement for their forthcoming engagement the following evening. Except when Saturday 21 May 1960 arrived the Silver Beats weren't there. They'd gone off on a tour of Scotland backing the singer Johnny Gentle. Typically they hadn't bothered to tell Brian Kelly they wouldn't be able to make it. He was not pleased and they didn't play for him in Seaforth or anywhere else for another eight months, Bob Wooler having to smooth the way for their return. In the interim the Beatles had travelled to Hamburg, the long hours on stage transforming them from a "bum group" who couldn't get a gig in their own city, to the most in demand band in Liverpool. Having to put aside what he may have thought about them as people Brian Kelly knew he simply couldn't afford not to book them. 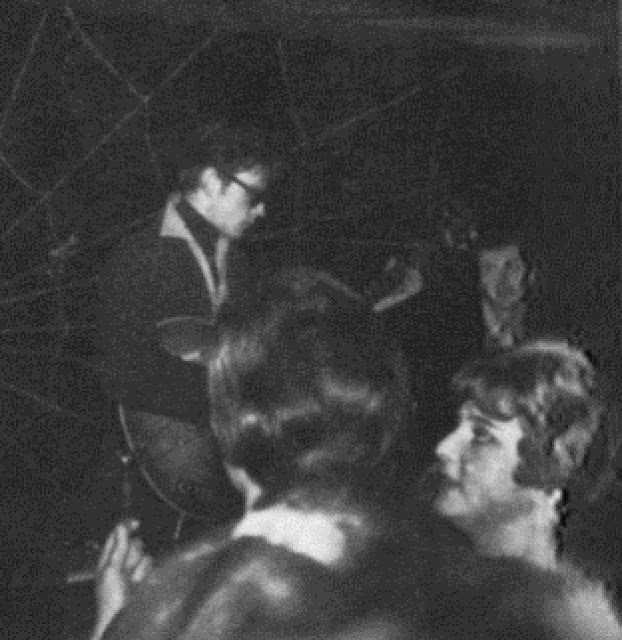 When the Beatles returned to Liverpool in December 1960 Stuart Sutcliffe had stayed on in Hamburg. He finally came home around the 15 January 1961 and took his place in the group a day or so later, ready to play the upcoming gigs at Lathom Hall. The Beatles had all witnessed violence at venues in both Liverpool and Hamburg but the unfamiliar north end of the city around Seaforth was particularly rough. A lot of the Teds in the audience were likely to have worked on the local docks during the day and seemed to have a strong territorial mentality so the Beatles were often looking over their shoulders after a gig in case one of them had said the wrong thing or looked at the wrong girl, or John had done one of his great big winks, which delivered with just the right amount of sarcasm and provocation would really wind the Teds up. Pete Best: When we’d done our session and came off, we changed, which didn’t take an awful lot of time because we basically played in what we stood up in. Stu went out, followed by John and myself. “These lads started a fight with Stu after picking on him. We got to know about it because some people ran back to the side of the stage where we had come from and said, ‘Stu’s getting the living daylights knocked out of him. “So John and I dashed out. We threw a couple of punches, sorted things out and pulled Stu back in again. The fact that John and I had pitched in and got involved made (the teds) feel a certain amount of respect for us….as a result of the fight John broke a little finger. He still managed to play for a couple of gigs after that. He hadn’t complained …the next time we saw him he had a splint on it. 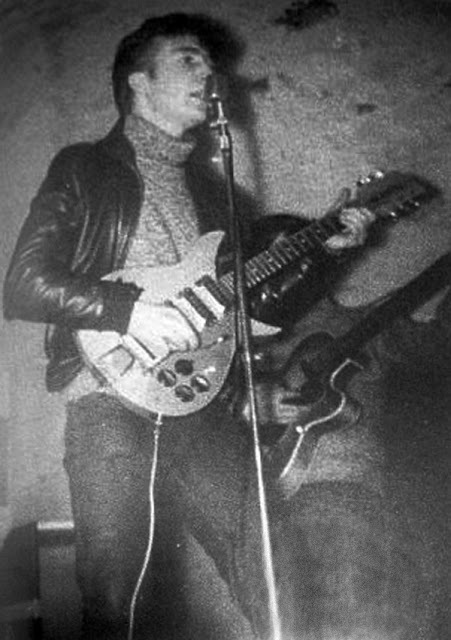 Although Stuart is partly obscured by John's guitar the photo is significant because it is believed to be the earliest photo of the Beatles on stage at the Cavern and the only one taken while Stu was still in the band. John still has a splint on his right hand - a souvenir from the fight at the Lathom. 4th, 6th, 10th, 11th and 25th February 1961. Three months after the Beatles final appearance three men were prosecuted after beating up a policeman outside Lathom Hall following one of Beekay's jive sessions. Acting upon the wishes of the local residents the council brought the curtain down on Lathom Hall as a live venue. Brian Kelly was quoted in the Liverpol Echo saying "these dances have been a pain in the neck for me". In May 1962 Stuart would die in Hamburg of a brain aneurysm. Whilst the definitive cause is unknown it has been linked to the traumatic head injury he received during the fight outside Lathom Hall in January 1961. Pete Best: When people talk of Stu being beaten up, I think it stems from this incident. But I don’t remember Stu getting to the stage where he had his head kicked in, as some legends say, alleging that this caused his fatal brain haemorrhage. After the Merseybeat boom the venue became a Royal Navy Club and was then left derelict for some time. In 1989 Brian Corrigan purchased the building and together with his son Dean completely refurbished the premises. Today the Lathom still books some of the legendary Merseybeat groups and over the last few years has featured appearances by The Searchers, The Merseybeats, Kingsize Taylor, The Undertakers and other original bands from that era. It's also worth mentioning that the club is one of the few venues left in Liverpool where you can still stand on the original stage where the Beatles played. I've visited Lathom Hall a few times over the years but until now I've never been in. I have to admit that the large Blackpool-Illuminations style Hippy outside put me off. It looks a bit, well, tacky I suppose. Tune In to see whether I changed my mind when I finally ventured into the venue in the next post. * Beekay as in B.K. - Brian Kelly's initials. Picture Palaces of Liverpool by Harold Ackroyd.